Android Market is packed with apps, hundreds and thousands of them, and finding a good quality app can be a tedious and frustrating process. In the Education segment alone there are over 3,000 free educational apps available for you to download. Here we dig deep and uncover ten of the best free Android apps for kids. AniWorld Lite is an excellent app for kids aged one to five. It teaches kids the names of different animals and gives them a chance to feed and pet them. While the app itself is very basic, it's the "Hey, pet me" feature that will have you and your kids rolling on the floor. HomeWork is not a fun app, it's a helpful one and aimed at the older kids. Using this free app they can schedule homework and lessons, set reminders, plan for exam revision, and manage their time more effectively. It works well on a tablet, supporting both screen angles, and is extremely intuitive to use. Famigo Sandbox is a brilliant, and free, way of making your Android device safe for your kids. It includes a free app of its own for kids to play as well as listing certified safe apps for parents to browse and choose from. There are no ads or in-app purchases and you get shown games and activities that are platform and child specific. 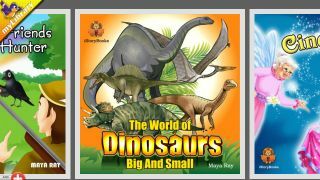 Free books complete with voice-over, pictures and alternative languages. Fancy teaching your tot Spanish? There's a Cinderella for that... iStory Books is a simple but sweet app that's good for entertaining the kids. Eleven free books are included from the get go with new ones added every two weeks. Ant Smasher is a free app kids and adults can enjoy with vicarious murderous intent. Smash the ants with your finger, don't smash the bees, try not to die. Sound easy? It isn't. Addictive fun for kids aged four and up, and ideal for building their reflexes. 0-10 Numbers is all about overachiever baby having fun with numbers and it is excellent for what it does. Bright colours, anthropomorphised characters, careful enunciation, it's a learning resource that works well for kids aged two to four. A clever and sweet title, Kids Numbers and Math offers your kids the basic stepping stones into the world of numbers. The app is hugely entertaining and kids will enjoy learning the numbers 1-20 with the variety of exercises on offer. The paid version allows for more customisation but the free version is just fine for number learning fun. Steamy Window is plain daft and completely brilliant. Kids love making pictures on steamy windows so just hand them the tablet or phone and hit Steamy Window and, voila, they have steam galore to play with. By blowing into the mike you create more steam. Genius. Remember that game that had you hooked as a kid? Nab Classic Simon for free on Android Market and play it for hours. Entertaining, challenging and excellent for building memory skills in kids and reminding you that yours isn't quite what it used to be. How To Make Paper Airplanes has to be one of the best free apps for kids and parents around. Think about it, how many times have you built a paper airplane and failed, watched it crash into the wall or fall into the sea? Well, now you and the kids can create some impressive paper creations that should, theoretically, fly like a dream.